Roti isn't so much a food in Malaysia, but a way of life. You can't go anywhere without seeing someone scarfing them down, or a restaurant selling them. But what exactly is roti and how did it become such a thing? And what are all these different kinds? Roti, which in Malay simply means "bread," is a catchall term for a variety of bread-based food items that are eaten every day. It predominately refers to flat bread, as the name comes from the indian flatbread of the same name, but you may know as chapati. You rip them apart and dip them into curries. Rotis are so common in Malaysia because of colonialism. The British came in and took over the place, and then brought over thousands (if not millions) of Indian people from the state of Tamil Nadu (home state of the city Chennai/Madras) to help build up their newest addition in their empire. Of course, these Indians brought over their cuisine and their culture, and well it just permeated throughout the region. 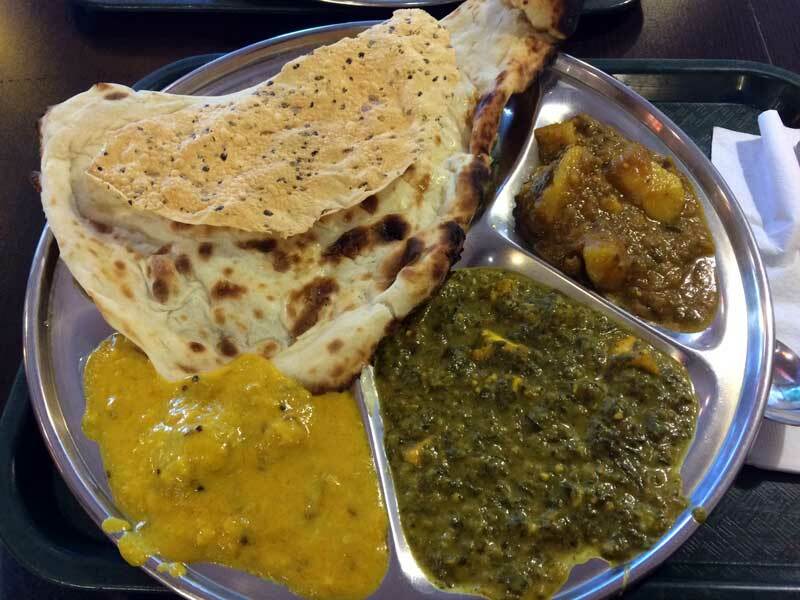 Although there used to just be a few kinds of roti, nowadays there's a head-spinning array to choose from at nearly every restaurant. Here's a guide of what they all mean. 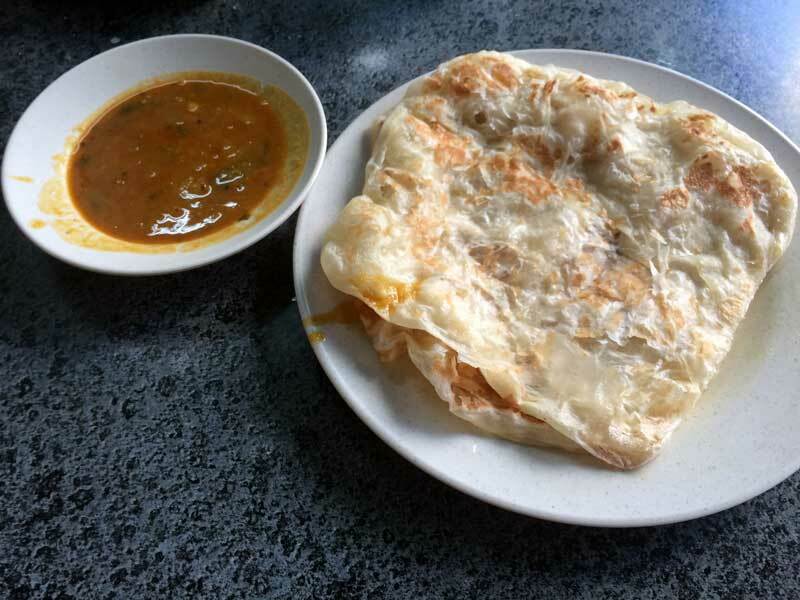 Roti canai is the basic roti that almost all the others are based off of. Although named roti, it's actually more similar to the Indian flatbread of "parotha." Unlike roti/chapati in India, which is just flour and water rolled out into a flat disc and grilled, parotha and roti canai has a lot of oil, and is twirled around to give it a flakey, layered texture. Roti canai actually translates to "flying bread," which it was lovingly called due to the way it's prepared. It's flung into the air, spun around, and slapped down on the counter over and over. They cook it on a oiled flat grill, and drizzle oil on top each time they flip it. Like most rotis, it's served with some sort of curry or sauce to dip in, which is always included in the price. The most common are daal (a soupy lentil curry) and kari ayam (chicken curry–without the pieces of chicken). I often asked for both, because they're both great, but the kari ayam is extremely delicious. Bawang in Malay means "onion." This variation is really just the addition of chopped red onion inside the normal roti canai. It offers a nice crunchy texture and a sharp flavour. It can be a bit messy as the onion tends to fall out all over the place, but well worth your time. A roti telur/telor is a roti canai with an egg cooked inside of it. It's prepared by throwing it on an oily grill and cracking an egg on the inside and scrambling it around. After it's cooked a little, they folded it over into a rectangle and flip it. The egg adds a subtle flavour as well as much needed protein and substence (in my opinion), making it much more filling. 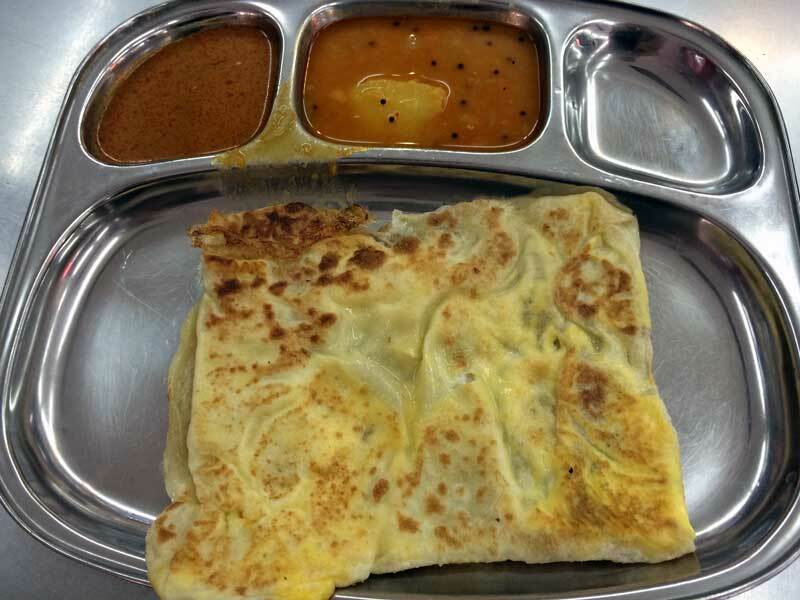 I'd normally need two roti canai, but one roti telur would be fine. 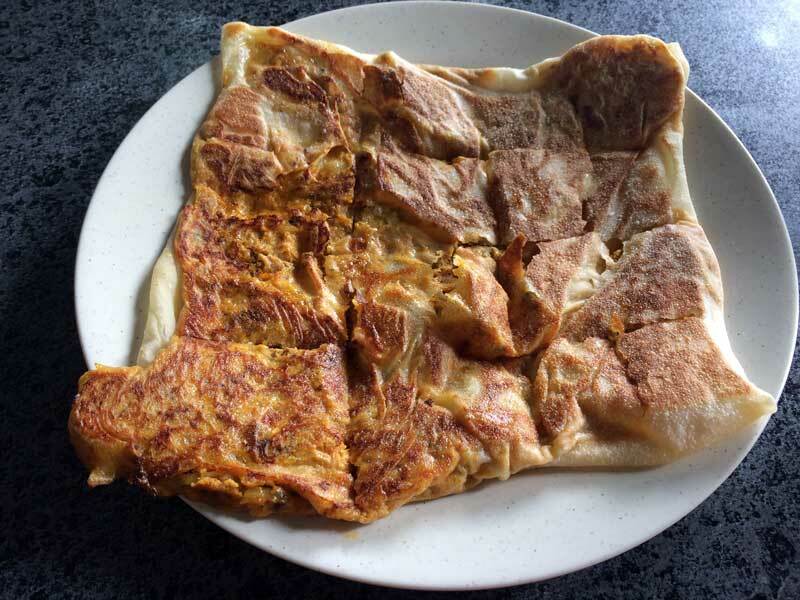 You can also get a "roti telur bawang," which is a roti with both egg and onion, a great mix. 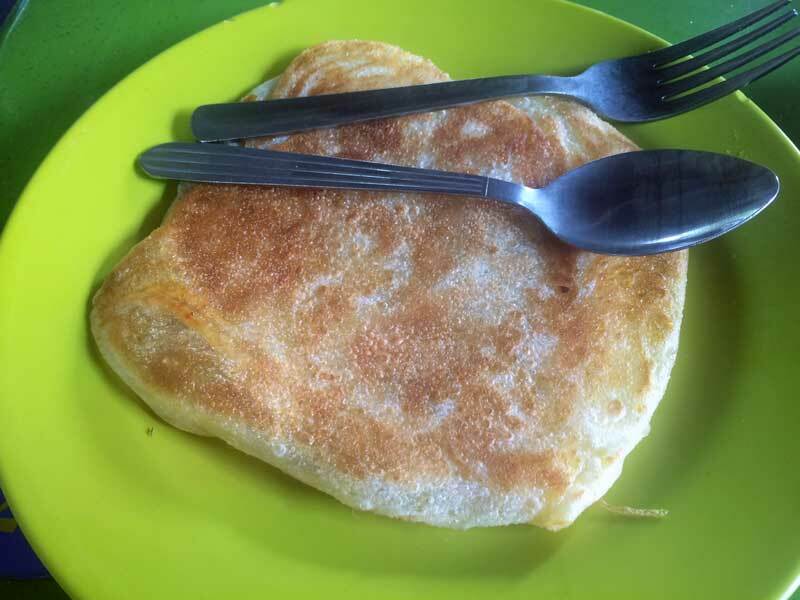 A roti tampal is a not-so-often seen variation of a roti telur. Instead of the egg being cooked on the inside of the roti, it's instead cooked on the outside, giving it a interesting appearance, and also causing the egg to a bit drier. I personally prefer the standard roti telur since the egg retains a bit of moisture, but if you're looking to live inside-out, give it a try. Planta is that near glow-in-the-dark neon yellow spread they lovingly call margarine in Malaysian. Some places will try and translate "planta" as butter, but it's a lie. It's margarine. 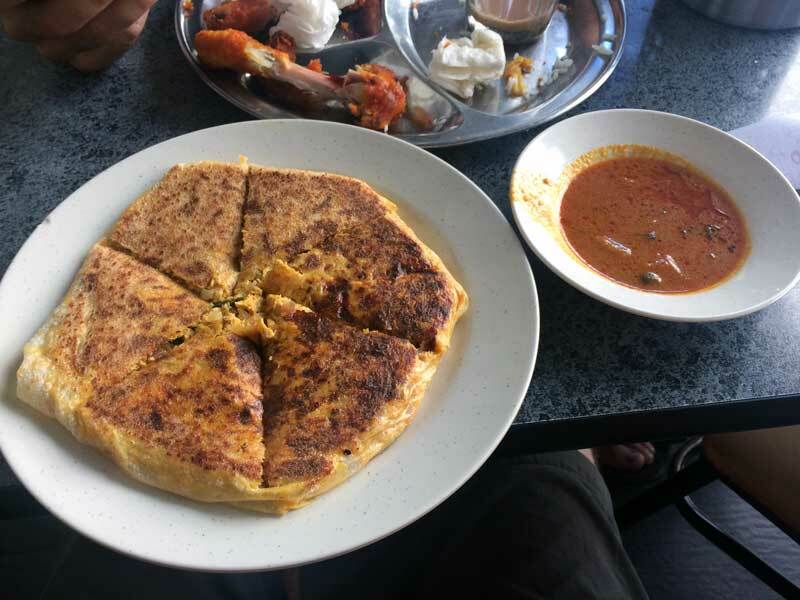 A roti planta is a roti canai that is absolutely chock full of margarine, giving it a much more rich and "buttery" flavour. Not the healthiest, but if you love to live dangerously, go for it. Well I think you can probably guess that this variation is. It's a roti that's loaded with cheese. To be honest, I'm not really sure what kind of cheese they use in Malaysia, but based on colour and taste I would assume some block form of mozzarella similar to what you'd get on a pizza. Roti jala is by far my favourite roti. It gets its name of "net" or "web" bread due to it's spider web or swiss cheese like appearance. 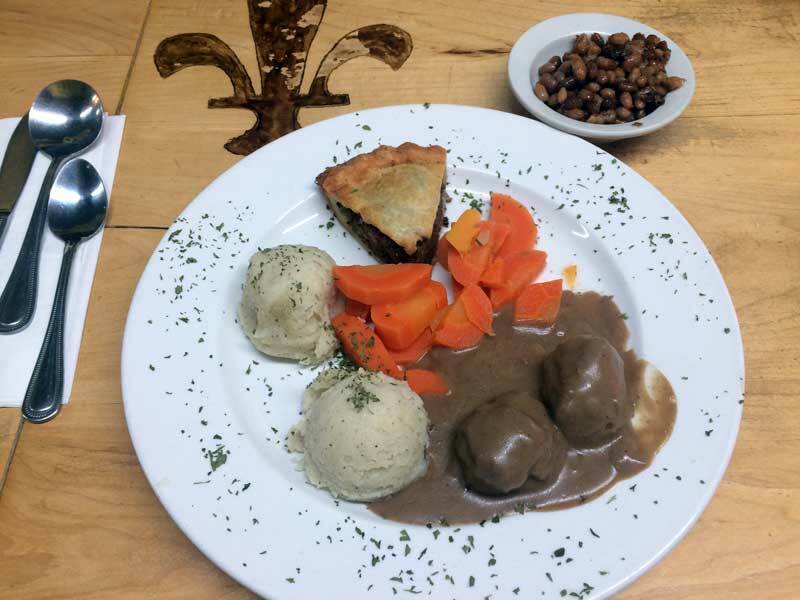 It's prepared by pouring the dough into a dish with several spouts coming out the bottom and then spinning it around over a pan as it pours out. 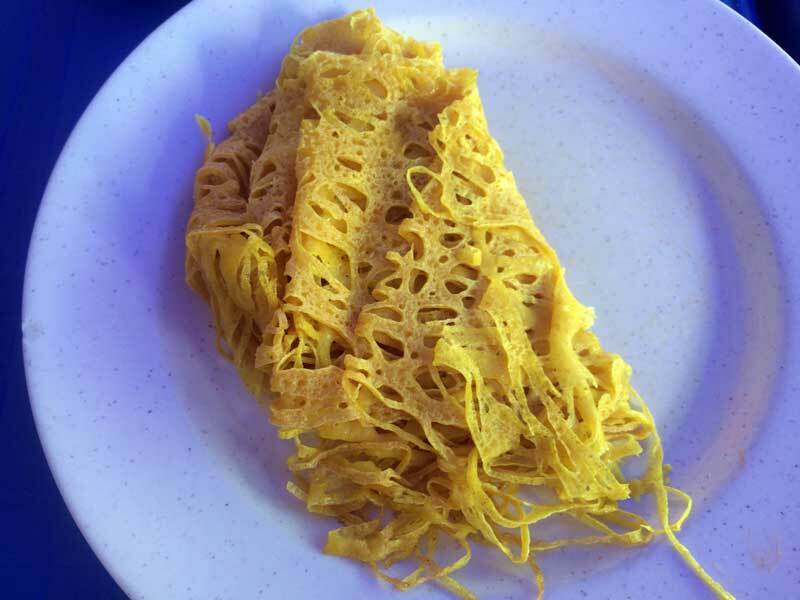 Unlike the other rotis which are just flour, water, and oil, roti jala is prepared with flour, egg, milk, and a pinch of turmeric (giving it the yellow color), which gives it a much gooier texture. It's often served in sets of 2-4, and pairs wonderfully with a daal or meat curry. This is the only roti that ever made me grunt and mutter profanities in public. Tissue bread, or paper bread, or even rocket bread, is both a meal and a show. This roti is spread out until it's paper thin, creating a nice crispy texture. Now it's sometimes called roti rocket because as they serve it on your plate, they wrap it around into a sometimes several foot high cone, almost like a dunce cap. It's flaky, crispy, tasty, and quite a sight. Murtabak is officially the only roti on the list that doesn't contain the word roti. This dish has Middle Eastern origins (probably came around the same time as Islam), and is a roti stuffed very thick with a mixture of meat (chicken, lamb, or beef) with onion, spices, and maybe even some cheese. Rip it apart and dip it in the classic curries, and you have yourself an extremely filling and hearty meal. Roti Sardin, as you might be able to guess, is a roti stuffed full of sardines, vegetables, and a load of spices. I know it might sound strange, but it's actually incredibly good, and isn't overly fishy. It's actually an excellent alternative to murtabak, as it's nutritional similar, equally filling, but it costs 1/3 the price. People normally eat roti sardin with a fish curry, but there's nothing stopping you from eating it with daal or chicken curry. So roti bakar just means toasted bread. I found this also meant that is smothered in kaya jam, which is a brown, hyper-sweet coconut jam that is quite addictive, and some lovely planta (margarine). 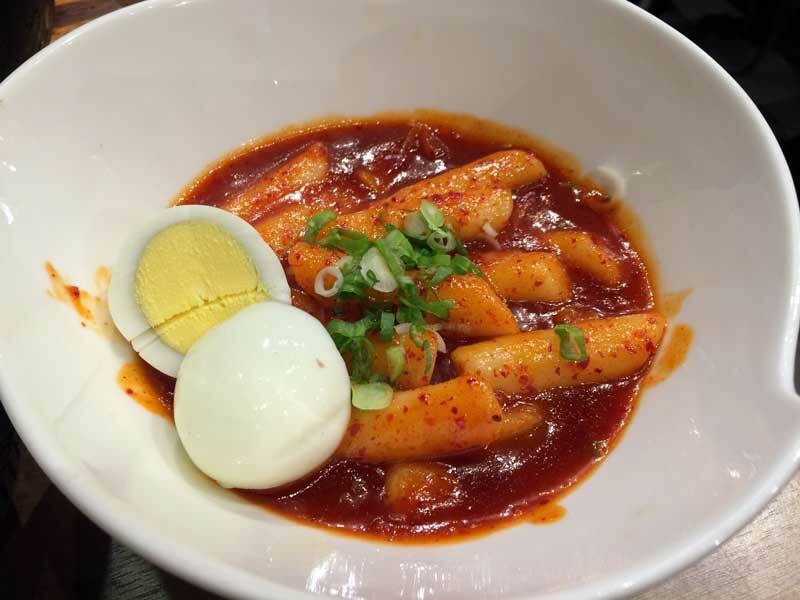 They also normally crack some half-boiled eggs, which is strangely an egg with a fairly set yolk, but quite runny white. Add some salt, and the salty, eggy, buttery, and sweet combination will surprise you. Roti John has its origins both in name and ingredients from England. 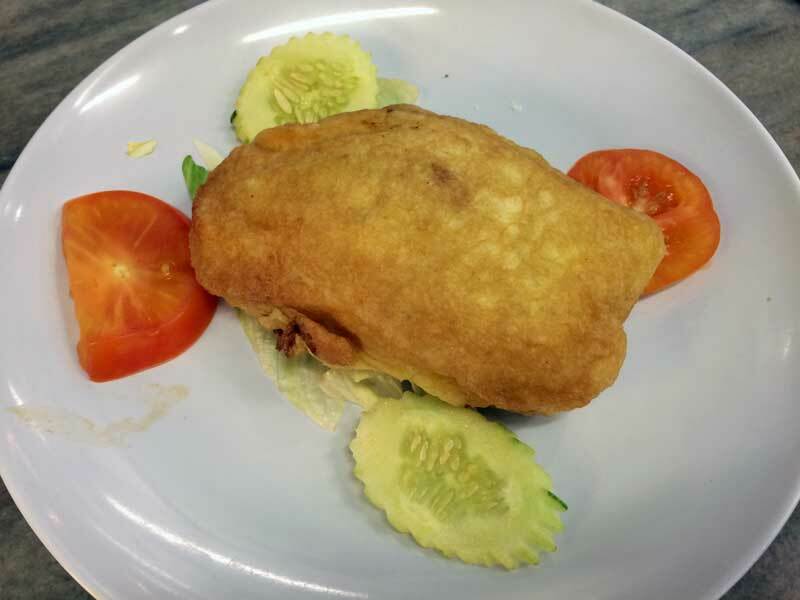 Roti John is an oblong sandwich containing omelette, meat, vegetables, and layered in an insane amount of sweet, spicy, and ranchy sauces, and cut into pieces. 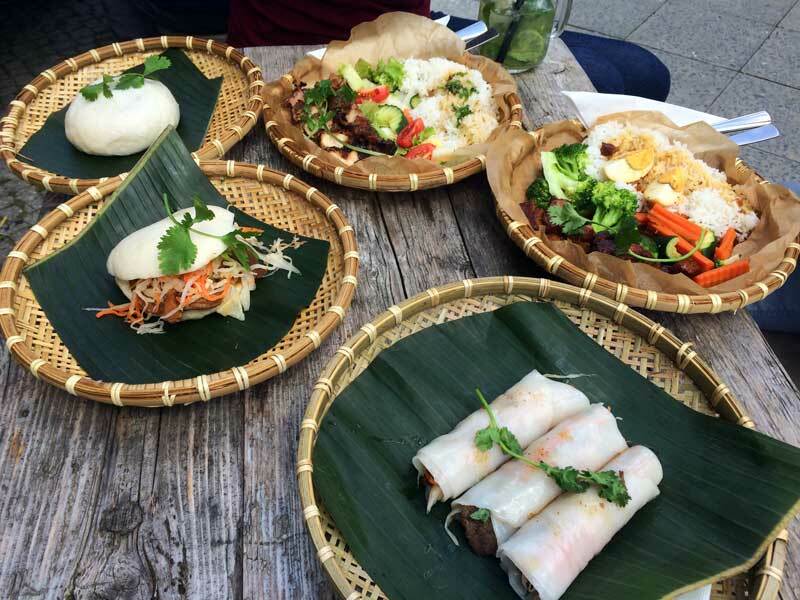 It's harder to find, and is more of a street food or market type meal than a typical breakfast joint one. Try it out if you miss something resembling a sandwich. 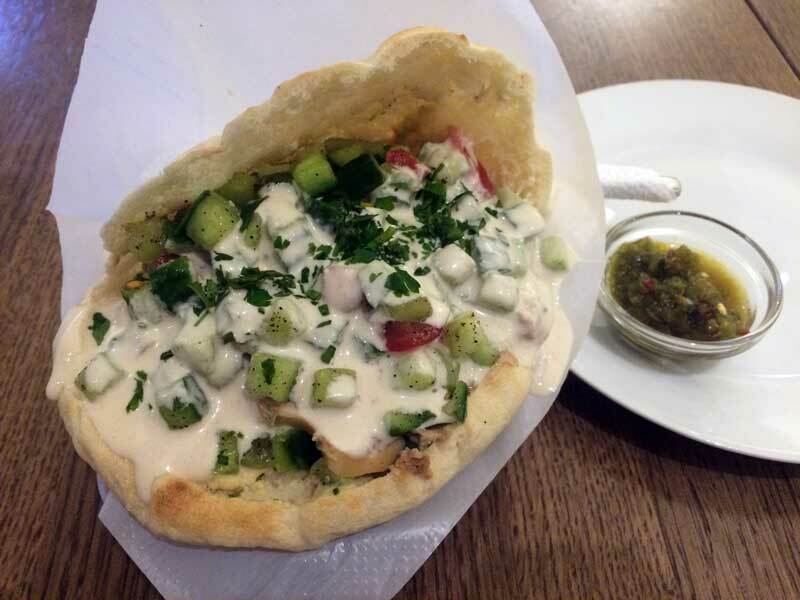 Roti Arab is also referred to as "big bread." It's essentially an extremely thick roti, giving it a much more classic European bread loaf taste and texture. You won't find it often, but it does exist. 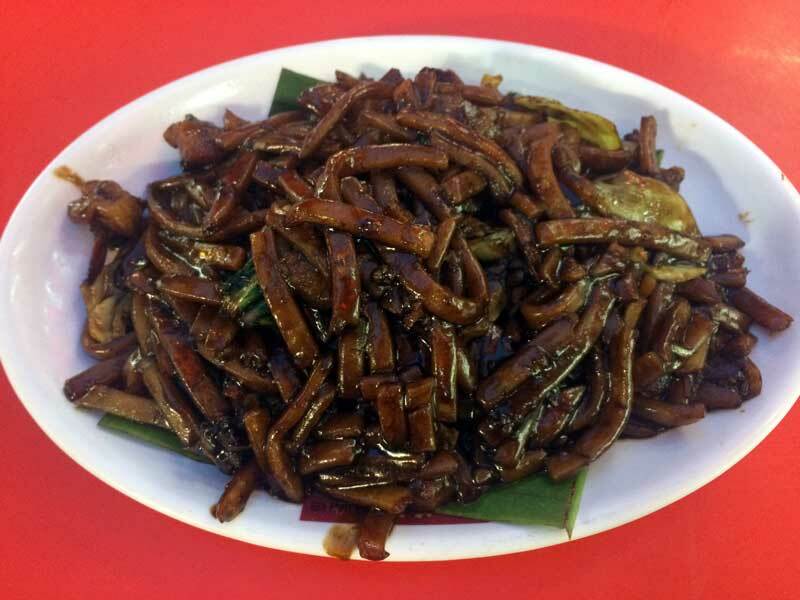 Roti Babi is quite possibly the only with Chinese-Malay (Nonya) origins. Thanks to this, it's definitely the only roti you'll find that contains pork. Hell, it's even called "pig bread." 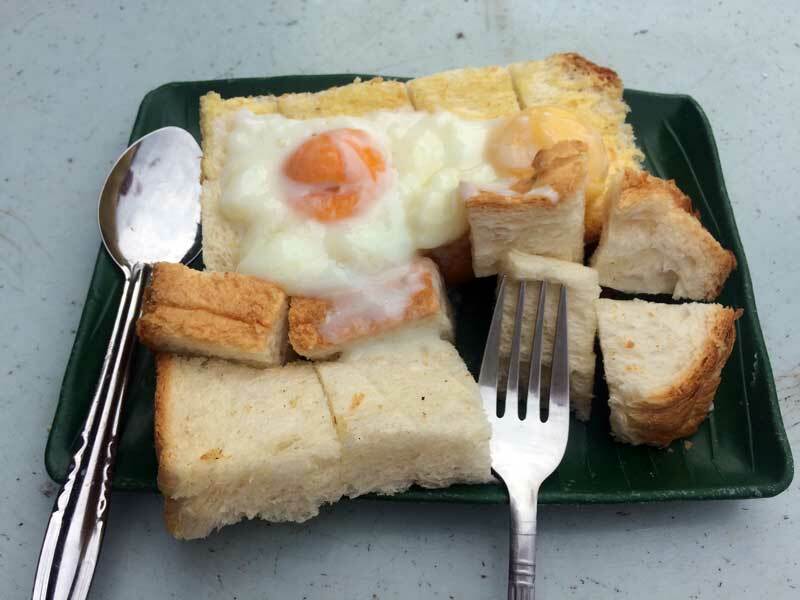 Roti Babi is made by hollowing out bread slices and stuffing them with minced pork and onions, dipping them into an egg bread, and then deep-frying them. Serve with some salad (to be healthy, obviously), and you're good to go. The bread oozes oil as you eat it, making it a sinful breakfast delight. This is the most basic of the sweet rotis, and is actually just called a "sweet roti." Take a normal roti, load on a bunch of sugar. Sweet rotis can either be eaten with the normal curries, giving a nice sweet and salty mix, or you can dip it into condensed milk for a crazy sweet dessert. 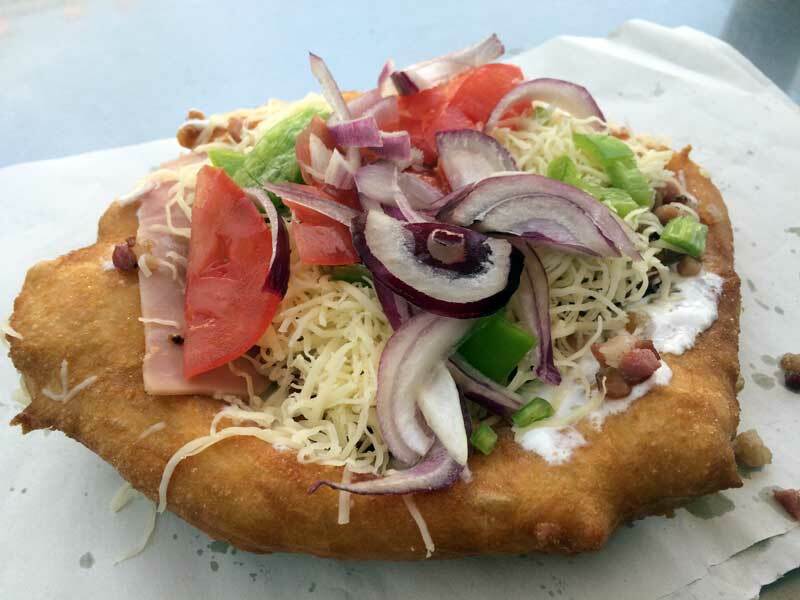 A Roti Boom, or a Roti Bomb, is aptly name as it is a definite calorie bomb. You make it by loading a roti full of planta (margarine) and sugar, and then twirling it into a smaller, denser package. It's extremely decadent, but incredibly delicious. The beloved breakfast or dessert roti with chopped banana (and maybe some sugar) on the inside. It's a great sweet treat with a far less artificial sweet flavour than the ones to follow. If you remember my description of kaya up above for the roti bakar, you'll guess that it's a roti chock full of kaya jam–a local hypersweet confiture made from coconut. It's a cultural and delicious experience, and of course if you don't find it sweet enough already, you can dip it in some condensed milk. Milo is to Malaysian as Nesquik is to Americans, expect I think to a more fanatical degree. It's a highly sweetened hot chocolate powder that is found in drinks and snack aisles across the country, and a roti milo is simply a roti with a generous powdering of Milo. Dip it in condensed milk for a divine experience. Like Milo, Horlick is another sweetened drink powder, but instead of chocolate it's malted milk. If you'd rather have your roti taste like malted milk, then try out this variation. This is a somewhat rare variation that is rather new, a roti smothered in chocolate sauce. I think you can imagine what that's like. Delicious. That's right. The West has invaded the East to create this truly fantastic dessert roti filled with banana and nutella. 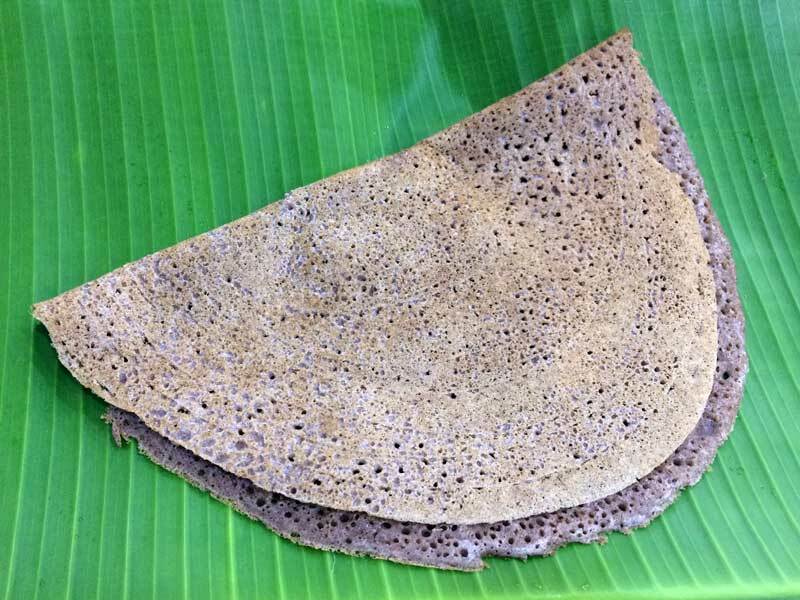 It's incredibly similar to a nutella banana pancake/crepe you'd find in the West (or Thaliand), but it has a flakier but tougher texture due to being stuffed into a roti. Try it out, you won't regret it. So there's a brief history lesson in rotis, and a guide to all the different kinds, now it's time to get out there and start trying to check them off your list. You'll never learn anything if you don't try something new. Even if you don't think you'll like it, try it anyway. At most you'll waste 40 cents. Got a favourite that I missed? Let us know in the comments below.